The average kitchen sees heavy duty use on almost daily basis. Being one of the hardest working areas of the house, the kitchen needs proper cleaning quite frequently. 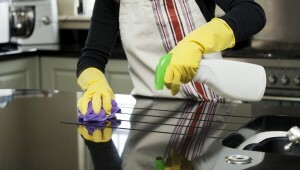 However, ongoing and effective kitchen cleaning can be a bit of hassle as it takes time, effort and some skill. Our professional kitchen cleaning at Cleaners Liverpool is the ideal solution for busy people who don’t really have the time to invest in such demanding housekeeping chores. Our professional kitchen cleaning service is very convenient, it is a real timesaver and ensures exceptional results no matter how much or how little cleaning there is to be done. The service is available as one off, or on a fixed schedule basis. The frequency of the regular cleaning visits is entirely up to customers. Kitchen cleaning visits can be requested for any day of the week, under flexible hours which don’t get in the way of our customers’ daily schedule. Our kitchen cleaning solutions are efficient and ensure professional standard results in minimum time, and of course with no additional hassle for our customers. In order to provide customers with outstanding results every time, we have made sure our cleaning technicians are up to scratch. The people we work with are experienced, efficient and specially trained to yield optimal results without risk of damage, errors or delays. Customers using our fixed schedule kitchen cleaning in Liverpool, are sent the same cleaners every time, unless otherwise requested. In our opinion this reduces cleaning time and effort, as the cleaners become familiar with the specifics and requirements of the job. The kitchen is a place where food is stored and dishes prepared, so the use of nontoxic cleaning supplies and materials is essential. Our cleaners will use and apply mild, nonaggressive products which dissolve and evaporate without trace or residue. We care for the health and wellbeing of people and the environment. Sink taps, basin, backsplash etc. Features like fixed chopping boards, dish racks etc. Of course, customers can alter the service as per their own requirements. 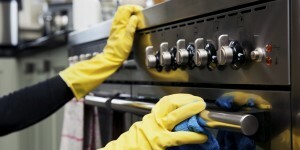 Our kitchen cleaning in Liverpool is designed with flexibility and convenience in mind. Additional or specific cleaning chores can be included as part of the service without too many additional costs of further hassles. We believe the service is fair priced and will not burden the household budget. Charged at hourly rate, kitchen cleaning ensures optimal value for money and moderate costs in most, if not all instances. For more information and pricing details for this or one of our many other services like the mattress cleaning, please speak to our consultants who will be happy to assist.